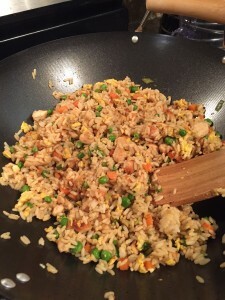 A few friends of mine have mentioned making fried rice within the past, and I’ve always wondered how easy it would be to do. 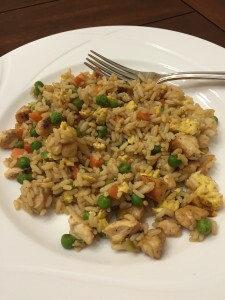 I pinned this Chicken Fried Rice recipe awhile ago, but decided now was the time to try it out! I was working from home, so I decided to make the rice during the day, and let it sit in the fridge until it was time to start dinner. 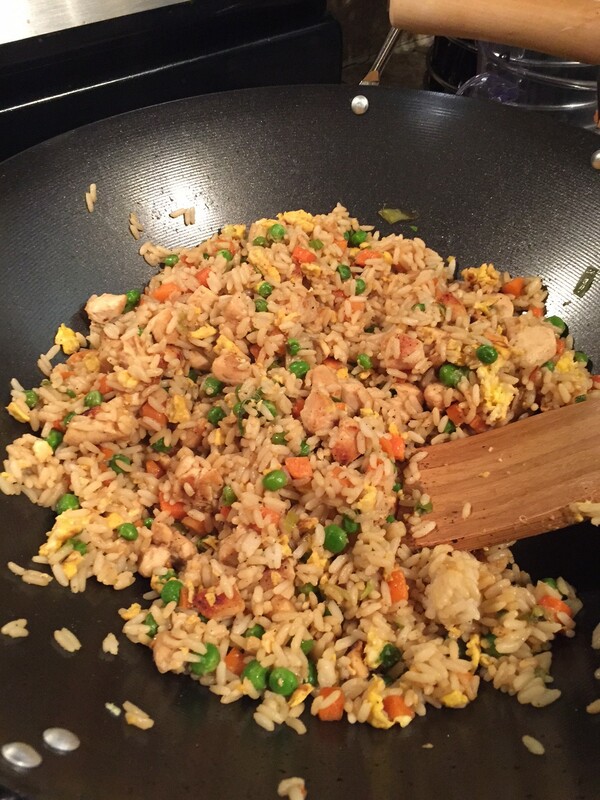 I think next time I’ll try to make the rice a day in advance, but a few hours ahead still worked out. I started by chopping up the chicken, adding the toasted sesame oil, and cooking the chicken. 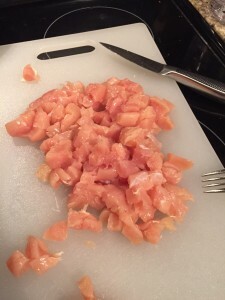 Once it was finished, I put it in a bowl and tucked it away in the microwave to keep it warm. Next up came the frozen peas and carrots and the green onions. I cooked those for a few minutes, then added the egg. 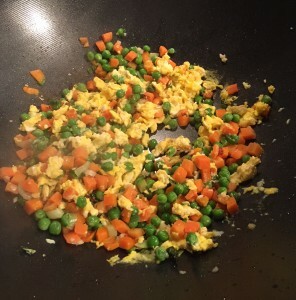 The recipe noted to push the peas and carrots to the side, and put the egg in. In retrospect, I probably should have put the egg in the center and made a ring out of the peas and carrots. It would have mixed in with the peas and carrots either way, but I wonder if it would have been easier. 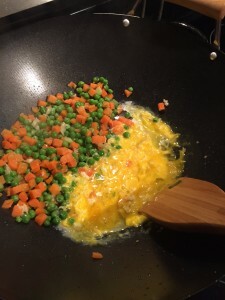 Once the eggs were cooked, I mixed all the ingredients together. Added the rice into the mix, plus the chicken, along with the soy sauce. While I got everyone together for dinner, I let it all sit and warm together before serving it at the table. We’re fans! 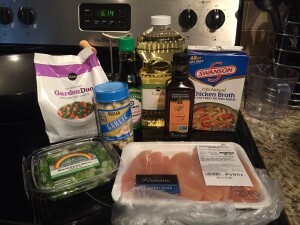 Going to keep this recipe in mind for the future for sure. Amy – 3.75 out of 5 stars. 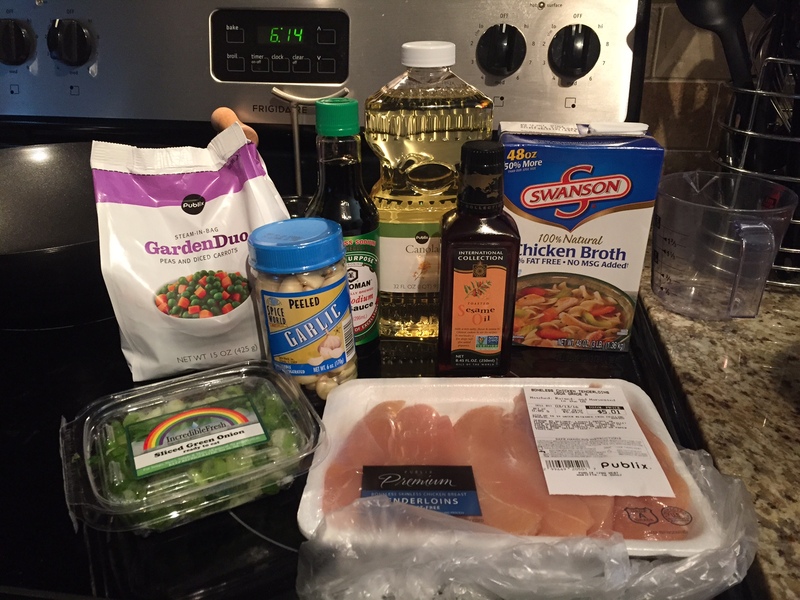 I love getting take out, so having an option to make at home that is likely a little healthier was nice.